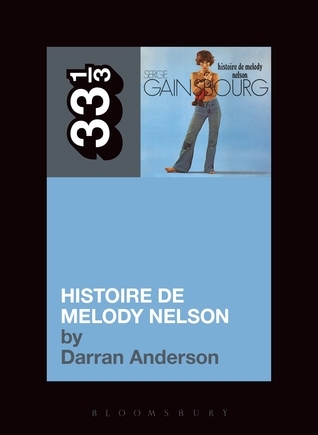 Darran Anderson's little study on one of the great albums that came out of Europe, "Histoire de Melody Nelson" is a superb study on Serge Gainsbourg and his masterpiece. First of all I am touched that both titles ("Gainsbourg" by Gilles Verlant & Serge Gainsbourg's short novel "Evguenie Sokolov) that i published are in the bibliography. So with the music and the books he's coming from a good place! Anderson's book is very brief, but there's no wasted words. He has a deep understanding of Gainsbourg's work, and not only does he talk about the Melody Nelson album, but it is also a brief biography on the great artist. As in the Verlant biography, it is moving as well as terrifying to read about Gainsbourg's childhood running away from the Nazis. Over time I have read tales dealing with the Occupation, but the Gainsbourg narration is one that really makes me emotionally aware how horrible those times were. Almost unthinkable, yet it is these surroundings that probably inspired the greatness in Gainsbourg's songs and his very own iconic stance against authority. The book also captures the flavor of Gainsbourg's love for literature and how that inspired him as well. Baudelaire, Jarry, Rimbaud, and the lasting influence of Boris Vian played a big role in how Gainsbourg looked at life and art. Anderson is a wonderful writer, and his smart, intelligent take on Gainsbourg is right on the button. Essential read for anyone who even has the slightest interest in the world of Serge, but also insightful in how bad things (occupation) can charge a shy figure into a warrior of sorts. This book along with Gilles Verlant (The granddad of Serge bios), Sylvie Simmons' English bio and Gainsbourg's "Evguenie Sokolov" we now have a great representation of the world of Gainsbourg in print.